the locus of the vertex ! Many students learn that the effect of varying the parameter a in the expression ax^2 + bx + c is to make the opening of the graph of the parabola either wider or narrower. Similarly many students learn that the effect of varying the parameter c is to raise or lower the graph. What is the effect of varying the parameter b ? You can use this environment to explore the question. 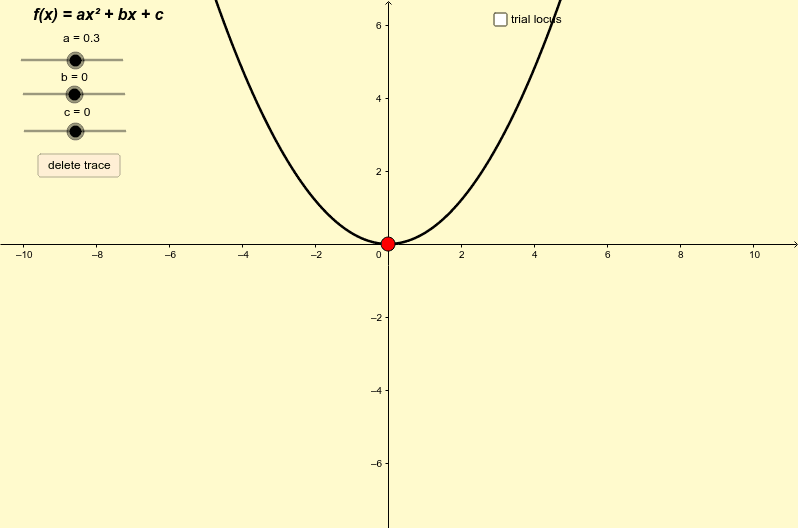 You can test your conjectures about the locus of the vertex by checking the "trial locus" box. Challenge - for fixed values of a and c , write an expression for the curve traced out by the vertex of parabola ax^2 + bx + c as you vary the parameter b .